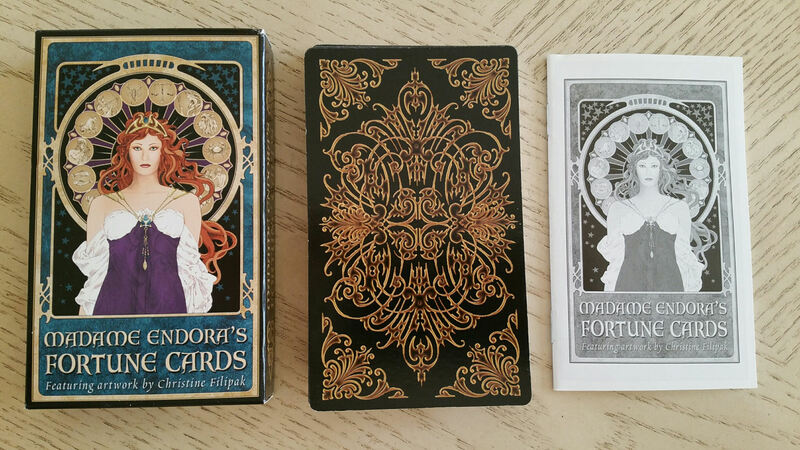 I’m so enthralled by Madame Endora’s Fortune Cards that I’ll be ordering a second copy to keep in its packaging and save as a back-up. The art is beautiful, digitally rendered, highly detailed, and awe-inspiring. I get a subdued Ciro Marchetti vibe from these cards. Let’s start with the deck structure. I love the thought that has clearly gone into this oracle system. 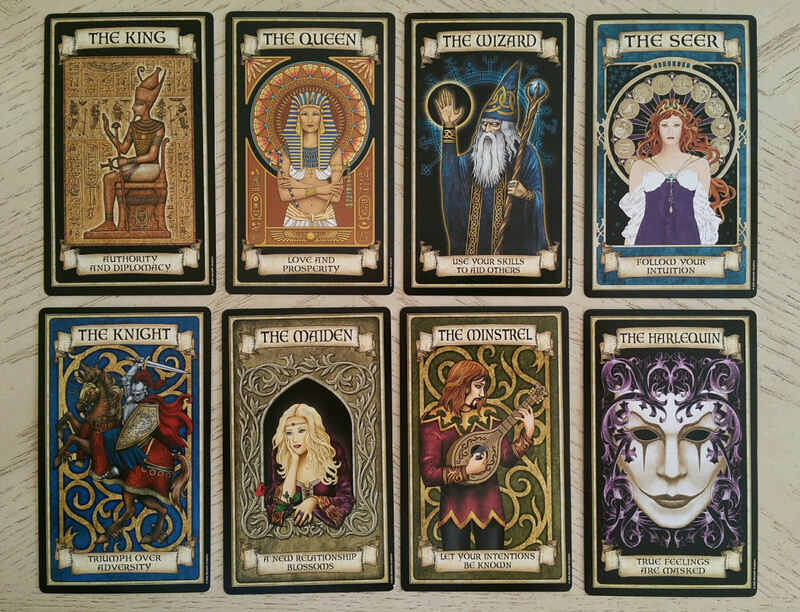 There’s the Royal Court, consisting of eight cards, that represent influential personalities or actual people and dispositions that might be at play in the matter you’re querying about. The Great Compassion Mantra of Avalokitesvara (Kuan Yin) is a dharani to be recited for purification, protection, and healing. I’d like to share with you a free downloadable copy of the text pre-formatted to the standard A5 trim size (with gutter and mirror margins for binding). You can then print and get your copy bound so that you possess a physical copy of this sacred text. The sacred text is definitively revered among Mahayana Buddhists. My context for offering this free book download is broadening that scope, however, and here, I’d like to invite you to consider the Great Compassion Mantra as a general tool for your personal spiritual cultivation, no matter what your path might be. Of course, take a look at what I have to share first, to see if it aligns with your own aspirations. Recitation of the dharani is used for personal healing but also for a practitioner to send healing to another. Healers are often drawn to the Great Compassion Mantra and working with the dharani, as it has a tendency to amplify their abilities. For those struggling with physical health or wellness concerns and you feel like you’ve tried everything else with little result, just give the Great Compassion Mantra a try. Common practices, applications, and uses for the dharani are provided in the free book. A physical copy of the text is also treated like a talisman, so it casts as sacred any space the book occupies, and wards off evil. (I’m using the word “evil” within the context of the religious doctrines associated with this particular text.) Though I don’t believe it’s necessary, you can consecrate your physical copy of the book through a consecration ritual where you invoke Kuan Yin and attune yourself to that energy, asking for the blessings of Avalokitesvara to empower your book and sanctify it as holy. The dharani represents the spoken words of Kuan Yin as she recites the names of deities from many pantheons (including references to Shiva, Vishnu, Indra, among others). As the mythology goes, the Great Compassion Mantra is Kuan Yin’s gift to us, a Key that will gain us access to spiritual awakening, greater understanding, wisdom, Divine Sight, and the strengthening of divine senses (also referred to as the four clairs–clairvoyance, clairaudience, clairsentience, and claircognizance). 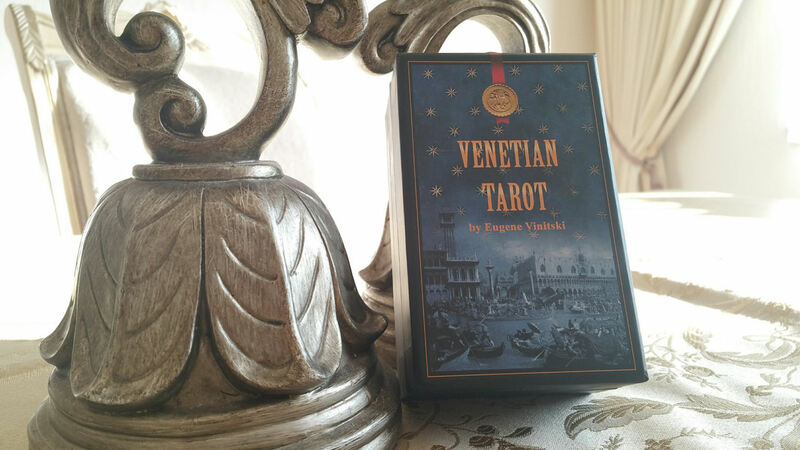 The Venetian Tarot by Eugene Vinitski is a self-published tarot deck that is magnificent for a variety of reasons. Art may be subjective, but I would be hard-pressed to find one person who does not acknowledge the exemplary skill level demonstrated here by Vinitski. Furthermore, there’s both an intuitive and psychological understanding of the human condition that truly gives the deck a transformative, transcendent quality. 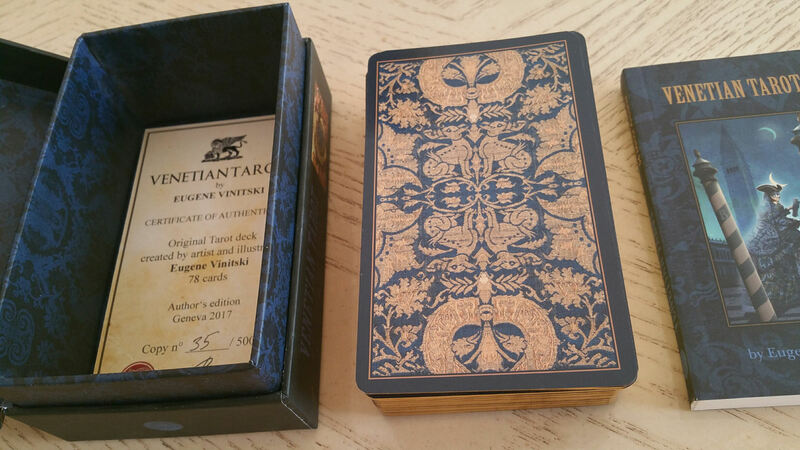 Vinitski has produced a tarot deck that’s at once beautiful and collection-worthy, yet also a great professional reading deck. Let’s begin with the packaging and card back design. I love the sturdy box style that Vinitski has chosen, its matte finish, and the complementary companion guidebook. The blues and rose golds complement the tone for the card by card Carnevale di Venezia inspired narratives. Also, yes, the cards are gilded and stunning with reversible card back designs. Vinitski is an artist and illustrator from Moscow who now lives and works in Switzerland. You’ve got to check out his portfolio of art, which you can find here. Before we talk about the deck, let’s talk about the artist. How people take photographs, I think, reveals a lot about them. There’s a sharpness to Vinitski’s photography that suggests a fine-tuned understanding of human psychology, which you see underscored in his paintings as well. Vinitski’s paintings (from his portfolio; we’ll talk about the artist’s point of view for the Venetian Tarot a little later) bear a strong interest in the human figure, depicting human emotion and interactions with a Post-Impressionist aesthetic. That keen understanding of people and human predilections sets a fascinating stage for the creation of the Venetian Tarot, where the focal point is on Venetian masks, or the masks we wear as devices to conceal our identity, our social status, and to maintain our anonymity when we act in defiance to our normal characters. 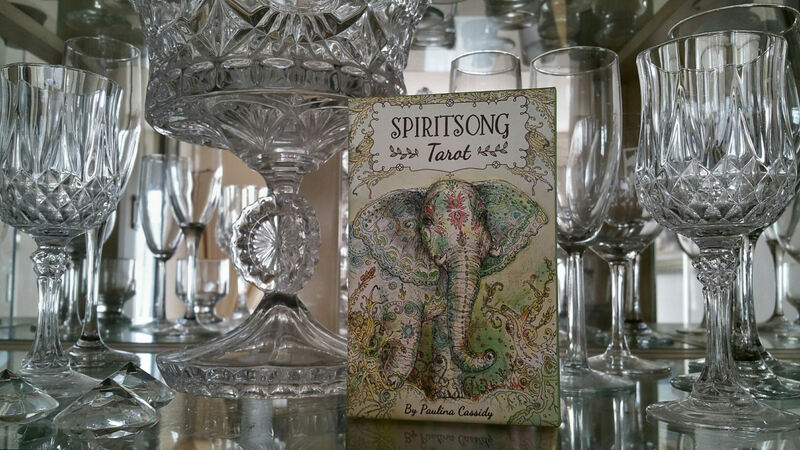 The Spiritsong Tarot by Paulina Cassidy is, at its essence, a spirit animal divination deck. The energies of each card in the standard 78 tarot deck is expressed by a selected animal spirit. I love the play on that term, too–spiritus animalis, the concept of weightless entities within us that operate our mind, that explain the currents of thought; the Keynesian economic theory of emotional and instinctual proclivities driving our decision-making behavior; and of course, that of animal spirit guides and the shamanic medicines each have to offer us if we invoke their powers. 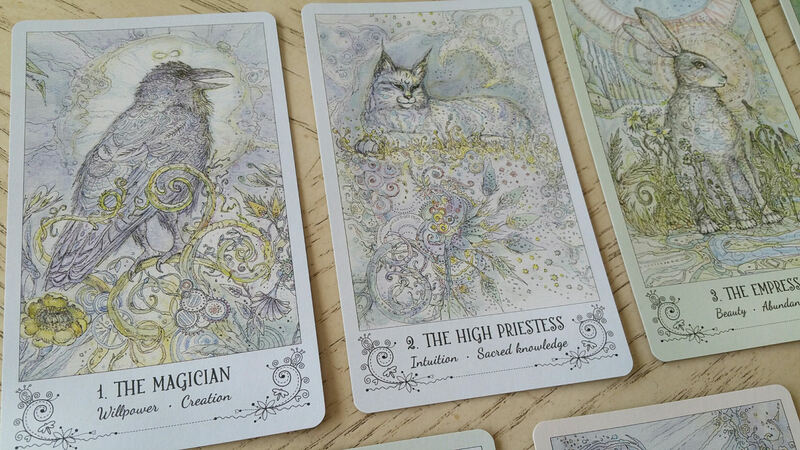 In crafting the deck, each card is intended to be a portal to a higher world, one connected to a particular animal spirit or animal mentor that is then called upon through the divination to offer you divine guidance. In other words, each tarot card represents a particular Shamanic medicine. Spiritsong Tarot is a great novice deck, as it has keywords at the bottom and I found the renaming of the suits easy and intuitive to follow. 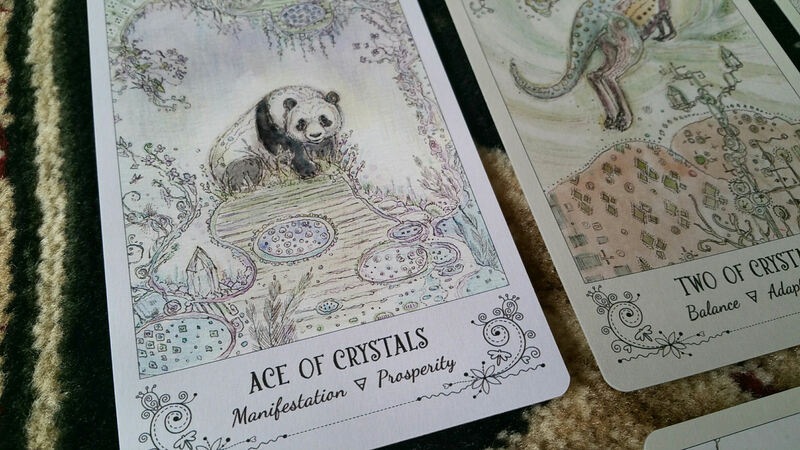 By the way, bonus points for the panda bear on the Ace of Crystals. How can I say anything negative about this deck after that? Now my only critique is there wasn’t a red panda (one of my favorite animals, evar).